I got an offer today! The headhunter called me with the offer, and I told him I’d think about it and get back with him. I’d like to ask for $5k more, but I’m not very good at negotiating—and I have no idea how to negotiate with a headhunter who stands between me and the employer. Any suggestions? What headhunters don’t like is a wishy-washy candidate. They want to know exactly what you want. They may not always be able to get it for you, but if it’s reasonable, they will try to satisfy you (and the employer) to get the deal closed. Too often, a candidate who is facing an offer will balk, but not because the money isn’t right. He may hesitate because he’s not sure he wants the job itself. You must be honest with yourself, and with the headhunter, on this point. If the job itself is the problem, discuss this candidly with the headhunter. Otherwise, you could send him off spinning his wheels trying to get you more money, when you’re not even sure you want the job. This is a key thing to understand about headhunters. A good one will work hard for you, but only if he’s sure you’re ready to take the job. Otherwise, why bother? If the problem is the job, then negotiate a different position. Give the headhunter clear directions. When you arm a headhunter with a firm number that will guarantee your acceptance, you give him great power to close the deal. Make that commitment to him, and you’ll quickly find out whether the extra bucks are possible. Then it’s all up to the headhunter—and his client. Negotiating with headhunters — and getting them to negotiate for you — is different from negotiating directly with an employer. This edition of the newsletter is actually an edited excerpt from How to Work with Headhunters… and how to make headhunters work for you. 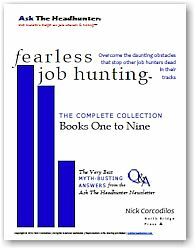 And that’s just one section (7 pages) of the 130-page How to Work with Headhunters…, including 62 myth-busting answers for fearless job hunters. Why stop here? Are headhunters difficult to negotiate with? Yah, sometimes they are. But, if you find them difficult, odds are good you’re not dealing with a good headhunter. The hacks want a quick buck. The best headhunters want a valuable addition to their network. They will hear you out, and try to help you if they can. Because one happy placement is worth many good referrals in the future… which is what good headhunters really want. 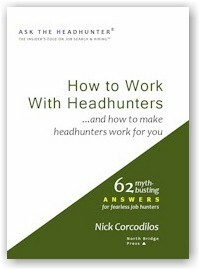 What’s your experience been with headhunters? Not just the worst, but the best? Please share your cautions, advice and stories. 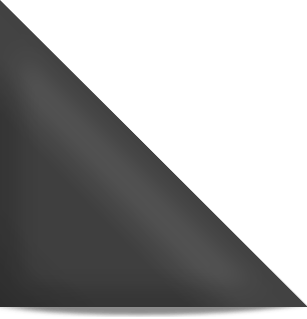 Most important — what can others do to negotiate the best deal through a headhunter? I am not into wasting my time. I don’t get the not very good at negotiation remark and personally I read that as fear. That is the limiting factor here. You aren’t negotiating with that person, they are a headhunter for Christ’s sake. They make an offer you state your terms flat out. Take it or leave it. 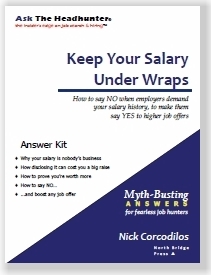 @Nick “What headhunters don’t like is a wishy-washy candidate.” True, but most employees are just that, and many employers eat it up. Nick, talk about a small world! I was just talking to a young engineer in my network Sunday on this very topic. He was contacted by a headhunter for something that fits well for him. He was struggling with the request for his salary history (from the recruiter). I told him pretty much what you said, but not as well organized. I also told him to research the recruiter, ask him if he had a working relationship with the client etc. which I think you covered much better in your link to Judging the recruiter. You are exactly right in everything you just wrote on this issue. With over 20 years as a “headhunter”, myself, I have followed this same direction. Every time I have come to a client with a reasonable counter offer from a good applicant we have closed the deal with the client. When you have a clear commitment from the applicant the client usually will accept a reasonable ofeer from them. Very good advice! First I enjoy your weekly newsletters and feel your concepts on demonstrating the job during the interview make sense. I recently had a similar experience that left a poor taste in my mouth for headhunters. A headhunter contacted me about an engineering management position that I was a very good fit for. He seemed to have done his research, knew my background, and everything started well, he knew my salary requirements and such. I went to two interviews discussed how I would do the job and got the offer. The problem is the job, as the headhunter presented it was continually changing, location of the job turned out to be 20 miles further away than initially discussed and the salary $5-10k less. I told the headhunter $5k more and he could accept the offer for me. The headhunter told me that negotiating wasn’t allowed in these types of situations(which seemed strange to me especially since the position was one that do perform properly required negotiating skills) and then the offer was rescinded. I did not like having a middle man that seemed to clog up communications and feel I would have landed the position if the headhunter had not been performing the communications (of course to his credit I would not have known about the position without him), but yes I agree you need to tell the headhunter upfront what you expect and make sure you are honest about it. I would expect a good headhunter to do the same and not waste everyone’s time. Negotiating is a part of the game! @Larry: I have never encountered a position where negotiating isn’t “allowed.” You can politely attempt to negotiate anything, without jeopardizing the deal entirely. I don’t know what the headhunter and the employer were doing in that case, but it seems pretty odd. And I wouldn’t call this a “good” headhunter, if the terms were changing all the time without clear notice to you. You are right, however, that the headhunter delivered the opportunity to you, and he controlled it. He blew it, but he controlled it. Sometimes the client company is at fault, because it behaves unreasonably toward the applicant and the headhunter. Sometimes companies believe that they hold all the cards, and damn everyone else. Thanks for sharing your story. On to the next! I get the impression that headhunters are like travel agents used to be: 90% of them are hacks but when you do find one of the 10% who are good, they can be extremely valuable. 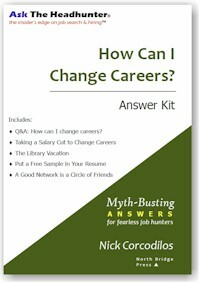 I have encountered one good headhunter and many amazingly bad ones in my career. I avoid them now unless I get a personal recommendation from another jobseeker. One of the bad ones: Headhunter contacted me about a job. I gave him my salary requirement (no less than my current job) and went on two interviews that seemed to go well. * Headhunter called with an offer for considerably less than my minimum and undocumentable, vague plans for future promotions/bonuses to bring it up to my minimum more than 6 months later. He claimed it was because they were not permitted to hire anyone at my level from the outside, which he had not mentioned at all before the interviews. I turned it down since it did not meet my minimum requirement and all the finagling about future extra payments sounded very fishy. He shouted at me over the phone, demanding that I accept it, and said I was unethical to turn down an offer that did (sort of) meet my salary requirement. So he wasted my time on a job that was obviously wrong for me and screamed at me for turning it down. * in one interview they gave me a required general-knowledge multiple-choice test that asked things like what is 36 ÷ 3 and what is the capital of the USA. I’m still laughing at the idea that a phone company gave this guy an account and a connection! You’re generous. My estimate is that 95% of both HR people and headhunters aren’t worth spit. The rest are saints and worth cultivating. The challenge is finding the good ones. It’s not impossible. Talk to people (and employers) who use them, then make a point of introducing yourself long before you need a new job.